Julie Dorsey, associate professor in the Department of Occupational Therapy, hosted the kickoff event for the Women's Mentoring Network Oct. 9. Dorsey created the Women's Mentoring Network to provide mentoring and networking opportunities for female faculty and staff at the college. After starting a leadership group last year for midcareer women at Ithaca College, professor Julie Dorsey BS ’01 MS ’03 has developed the Women’s Mentoring Network, a program for female faculty and staff to support each other in their career goals. Dorsey, associate professor in the Department of Occupational Therapy, hosted the network’s kickoff event Oct. 9 in McHenry Lobby in the James J. Whalen Center for Music. The event was a wine and cheese reception with opening remarks from President Shirley M. Collado. 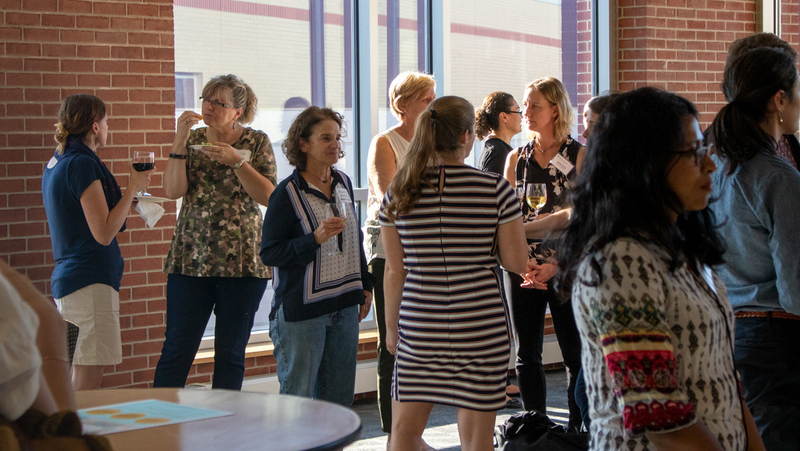 The Women’s Mentoring Network evolved from a group for midcareer female faculty that Dorsey started in Fall 2017 due to a lack of opportunities for midcareer women on campus to connect, Dorsey said. She received funding for the midcareer group from one of Collado’s seed grants in January 2018. 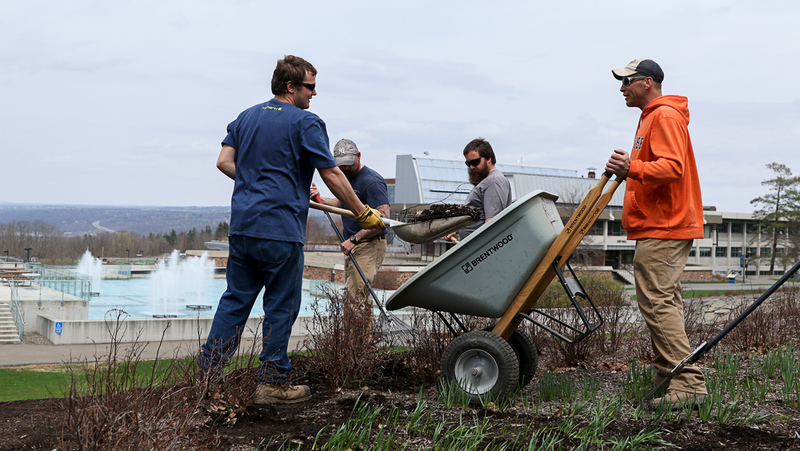 Collado’s seed grants are funds intended to support interdisciplinary projects. Dorsey used the grant to fund a workshop about how to create and sustain mentoring networks on campus. The workshop led Dorsey to expand the program to female faculty and staff in all stages of their careers, she said. “It kind of helped us all to think that there’s a broader need on our campus for women’s mentoring and networking opportunities, not just for midcareer,” Dorsey said. She said the network will consist of large-group networking opportunities, mentoring circles and one-on-one mentoring. She said the large-group opportunities will include three to four programs per year consisting of panel presentations, speakers, webinars or larger networking events. The mentoring circles will follow a peer-to-peer model of four to six women supporting each other without a designated lead mentor. The one-on-one mentoring will be the traditional style of mentoring with one mentor and one mentee, she said. The Women’s Mentoring Network will also have the opportunity to work with the next cohort of BOLD scholars, Dorsey said. She envisions that the scholars may join some of the mentoring circles or will participate in one-on-one mentoring with faculty and staff. Dorsey said part of the reason she formed the network is that women tend to have less access to mentoring networks. In a survey of almost 1,000 female professionals in the United States, while 82 percent of women said having a mentor is important, nearly one out of every five women reported never having a mentor. Dorsey said having a mentoring network can also allow women to share advice with each other regarding unequal demands that female faculty and staff members face. She said that because women tend to be seen as more nurturing, they may have students in crisis come to them more often. Dorsey met her first mentor when she was a freshman at the college. She formed a mentorship with Leslie Schettino, the former director of Student Accessibility Services. Dorsey said Schettino had a strong impact on her development as a student. Wade Pickren, director of the Center for Faculty Excellence, helped plan and fund the midcareer group and has continued collaborating with Dorsey on the Women’s Mentoring Network. Lisa Farman, assistant professor in the Department of Strategic Communication, said that when she worked in the advertising industry, it felt like there were not as many women in the higher job positions. She added that academia also tends to feel more male-dominated. Women mentorships can offer guidance in these situations, she said. “I definitely feel like it’s important for anyone who’s going into an industry where there maybe aren’t a lot of women to kind of have somebody who they can see as a model for what they want to be,” Farman said. Laura Amoriello, assistant professor in the Department of Performance Studies, said her first mentor was her female piano teacher, who she studied under for 10 years before enrolling in college. “She gave me guidance on teaching and how to get started with that and was always very encouraging,” she said. Amoriello said having a female mentor at the college would allow her to learn more about how women have coped with leadership positions, such as being a department chair, where the demands are high.